We are passionate about environmental sustainability as evidenced by our GreenLab initiative and related product offerings. Beyond GreenLab, we take measures to reduce the environmental footprint of our facility and operations, and invest in education and resources to a help support a cleaner and greener future for our business and community. KGI is committed to reducing its environmental footprint. To complement energy and water conservation initiatives already in place, including motion detection lighting in the warehouse and high efficiency plumbing and lighting fixtures throughout our facility, we formed a Sustainability Team to seek out ways to reduce our footprint even further. 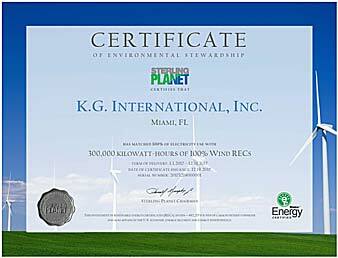 KGI is proud to report that we offset our entire electricity consumption for our facility for 2017 with 100% Green-e certified renewable energy certificates (RECs) from wind energy projects. KGI has been a proud sponsor of Dream in Green, a Miami-based 501(c)(3) nonprofit organization that is dedicated to promoting environmental sustainability in South Florida. In fact, KGI’s President, Nick Gunia, is the Founder of Dream in Green, serving as Chair of the organization from 2006-2014, and he continues to serve on its Board of Directors today. Dream in Green is best known for its Green Schools Challenge program, which educates K-12 students about environmental sustainability by getting them directly involved in real world conservation and recycling projects at their schools. Since inception, the program has been implemented in over 330 schools in Miami-Dade and Broward counties, the nation’s fourth and sixth largest public schools districts respectively. Learn more about our involvement with Dream in Green in this presentation.